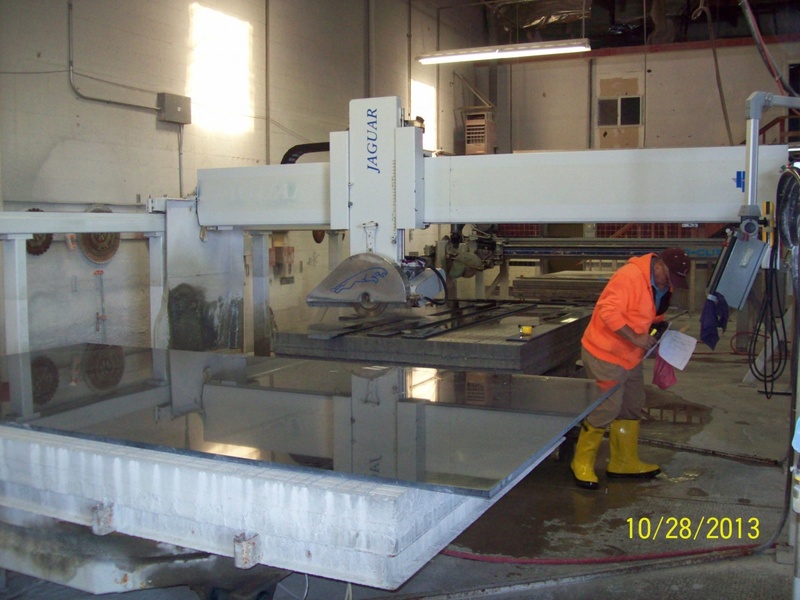 With over 60,000 square feet of fabrication facilities in Northern California and Las Vegas, Nevada, Superior Tile & Stone has the capacity to meet the most rigorous fabrication schedules while consistently delivering the ultimate in artistic stonework. Superior shapes the finest granite and marble slabs with a variety of precision cutting machines incorporating precise laser technology and dynamic computer control. These systems assure accuracy and enhance flexibility of design while simultaneously providing enormous cutting capacity. Superior’s high production water jets are each outfitted with two beds and dual heads to enhance Superior’s ability to meet difficult schedule requirements without sacrificing precision design and fabrication specifications. Multilple Comandulli automatic multi-spindle belt edge polishing machines are remarkable for their edge quality, performance and production on every kind of material. Multiple robotic CNC finish and shaping machines working in conjunction with four high speed inline polishers cut, route, shape and polish stone for large and small projects. These machines provide the capacity to finish thousands of lineal feet per day of the most integral edge designs imaginable. Before a piece of finished stone leaves Superior’s factory, Superior’s artisans carefully inspect and, where necessary, touch up the finished product by hand to ensure that Superior exceeds its customers’ specifications. To protect its workers and the environment, Superior performs all of its fabrication using wet processes, and recycles water and stone cuttings – processing over 20,000 gallons of water per day. The net result is environmentally conscious, consuming no more water than an average household! Efficiency and dedication extend to the shipping department that delivers the finished product, often within 24 hours. Superior’s team of artists, craftsmen and technicians demonstrate their pride of workmanship in the finished product. Delicate beauty lies within the world’s strongest materials. Homes, office buildings and hotels enhance their spaces with the charm and durability of granite, marble, tile and stone. This entry was posted in Fabrication and tagged CA, Fabrication, Granite, Marble, NV, Stone, Superior Tile and Stone, Tile. Bookmark the permalink.